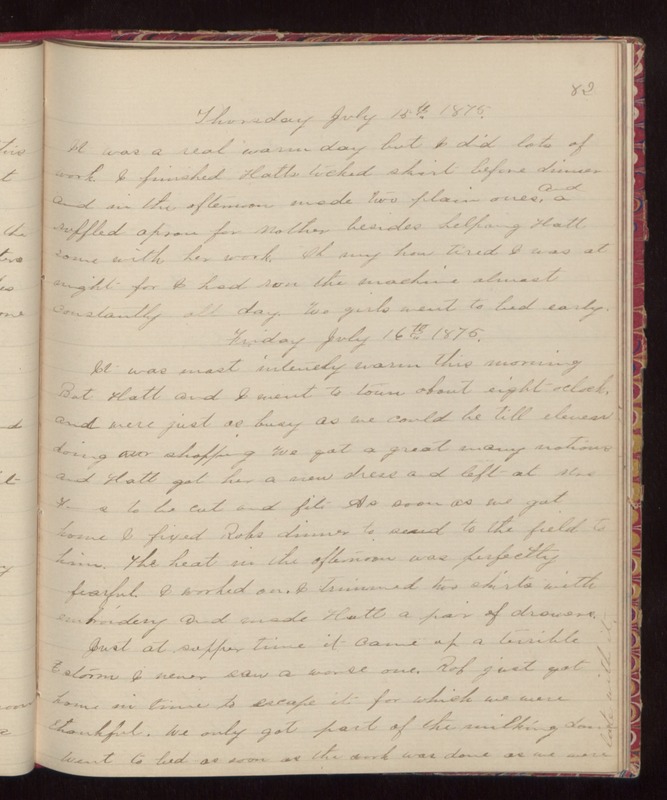 82 Thursday July 15th 1875. It was a real warm day but I did lots of work. I finished Hatts ticked skirt before dinner and in the afternoon made two plain ones, and a ruffled apron for Mother besides helping Hatt with some with her work. Oh my how tired I was at night for I had run the machine almost constantly all day. We girls went to bed early. Friday July 16th 1875. It was most intensely warm this morning But Hatt and I went to town about eight oclock, and were just as busy as we could be till eleven doing shopping We got a great many notions and Hatt got her a new dress and left at Mrs F_s to be cut and fit. As soon as we got home I fixed Robs dinner to send to the field to him. The heat in the afternoon was perfectly fearful. I worked and trimmed two skirts with embroidery and made Hatt a pair of drawers. Just at supper time it came up a terrible storm I never saw a worse one. Rob just got home in time to escape it for which we were thankful. We only got part of the milking done. Went to bed as soon as the work was done as we were late with it.